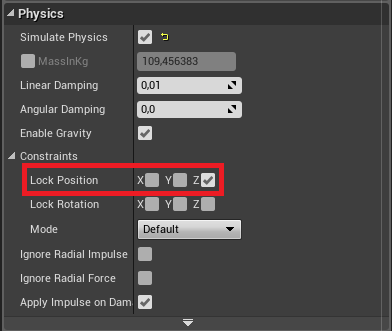 Is it possible to constrain a physics actor so thats its movement is attached to the floor, and if a force is applied it will not leave contract with the floor? Additionally could this be expanded to allow it to roll along the floor and up a wall perhaps onto a ceiling, like a strange version of magnetic air hockey! Many thanks, this is really important! Worth mentioning that im applying a force with a 'hammer' to a ball and want that force not to move the object off the surface at all think rocket league but were the ball is perma stuck to the ground! One simple way to constrain a physic actor to a plane (wall, floor) is by playing around with the constraints options inside the Physics category. In this example, I have locked the position on Z axis, which makes my physic actor stay on a plane parallel to the ground. You can aswell look into the Mode drop-down for more specific needs. But let's say I wanted an arena like rocket league with curved edges but I wanted the ball to never let go of the sides while still moving when a force is applied is this possible?